Starting in 2009, MSC Cruises' collaboration with the United Nations Children’s Fund (UNICEF) has contributed $3.7 million for a “Get on Board for Children” initiative, thanks to the generosity of MSC Cruises’ guests. The funds, donated onboard 12 MSC Cruises ships, go to UNICEF in Brazil to combat poverty and inequality; they help ensure children in 126 vulnerable communities of Rio de Janeiro and São Paulo achieve access to a quality education. In addition, on January 1, 2014, a new life-saving partnership between MSC Cruises and UNICEF began. The aim is to provide malnourished children with Ready-to-Use Therapeutic Foods (RUTF) – such as Plumpy’Nut, a peanut-based paste for the treatment of severe malnutrition, in developing countries and in countries affected by crisis situations. MSC Cruises said that malnutrition and famine claim the lives of over a million children every year and stunt the physical and mental development of many more. 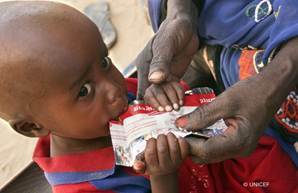 Severe acute malnutrition has traditionally required hospitalization. However RUTFs can be eaten straight from a sachet or small, disposable bag. Because they can be given to children without being mixed in water, they can work in any situation, at home and without medical supervision. “Around three sachets a day for four to six weeks can put a child out of harm’s way and with the generosity of our onboard guests, we will do our best to save and improve as many lives as possible,” says Gianni Onorato, CEO, MSC Cruises. By donating just US $1.50 to “Get on Board for Children”, MSC guests can help buy three meals of Ready-to-Use Therapeutic Food. A full treatment to save a child’s life in four to six weeks costs approximately $56. In addition to donations received from guests, MSC Cruises will also organize educational activities for children on board, raising awareness about UNICEF’s work and children’s needs around the world. MSC Cruises is a privately-held, family-owned, Italian cruise line; its MSC Divina sails year-round from PortMiami. For more information, visit www.msccruisesusa.com. *Photo of UNICEF provided by MSC Cruises. Photo of MSC Cruises logo on MSC Divina provided by Susan J. Young. All rights reserved. Please do not link to nor copy these photos. Thanks.